As I shared with the Northaven family in an email this week, I am feeling called this morning to address the issue of the “bullying” of LGBT young people that has been so much in the news the past few weeks. It seems to me that now is the time to speak out on this issue, and I believe God has given us the opportunity to do so today. As you may have heard, over the past few weeks, SIX young persons who were either self-identified as gay, or bullied as if they were, have committed suicide, including one here in our state. This is clearly a deeply disturbing moment, and the kind of thing that feels like an epidemic. So, this week I talked with Sam Wilkes, one of the directors of “Youth First Texas” (a Dallas-based group that offers support and services to LGBT youth all over North Texas). Many of you know well of “Youth First Texas,” and we’re pleased to count them as partners and friends here in the Dallas area. Sam gave me a chilling statistic: Last year, Youth First Texas did a survey of the kids their organization serves. That survey found that 50 percent of the kids served by Youth First Texas have not just contemplated suicide, but 50 percent had actually attempted suicide. (50 percent!) That, friends, IS an epidemic. These horrifying recent suicides simply point to a preexisting societal issue: that over and over and over, LGBT young people are being driven to the point where they seriously consider ending their lives. We MUST speak about this. The Church of Jesus Christ must speak about this. The first thing I’d like to do is to take a moment and address young people themselves. This is one of those places I hope this message gets out to those listening by podcast, or reading later. To young people everywhere: Please know that God loves you. Know that God loves you just as you are. Whatever you have been told by others about who you are, whatever you have been told in other churches about who you are, know that God loves you for who you are. Here at Northaven, we believe that God accepts LGBT people as good children of God. Every person has flaws. Nobody is perfect. But being gay is not a “flaw” to God. If you are hearing messages contrary to this, please know that there are many churches, many groups, who can help you. Maybe they are not very near where you live, but they are out there. And if you are feeling suicidal, please, please, please, REACH OUT. Find a trusted friend or loved one to talk to. Call our friends at the Teen Contact Crisis line here in Dallas. (Northaven has a long history with Contact.) Their counselors are trained to help sensitively and caringly help kids who are LGBT. You can find them at http://www.teencontact.org, or 972-233-8336. Our friends at Youth First Texas also offer many activities for LGBT youth, and I am told that young people come from all over North Texas, sometimes from small towns and long distances, to find support and connection among the Youth First Texas community. So, to the kids, PLEASE reach out. God would never want you to hurt yourself, no one in this church would want you to hurt yourself, and your life matters to God. (By the way, if you are adult who is experiencing your own questions, we here at Northaven are honored to be the home of the “Coming Out Workshop” led by our own Jim McBride. Jim is a very skilled counselor, and the group has helped many people in Dallas over the years. A new group is actually scheduled to start this coming Tuesday night. And you can find information at our church’s website). The second thing I’d like to say to young folks is to pick up on a phrase I have heard online a lot this week. I’ve been watching some videos called “It Gets Better.” It’s a series of videos addressed to young folks to send them the message that whatever they are going through, there is hope. It seems to me that we here at Northaven know intuitively know something about this. In some way, we can also give you the hope that “It Gets Better.” We have dozens and dozens of gay couples and lesbian couples who are raising their families in quiet and proud faith. They and our traditional families form what we call a “blended church” where everybody prays, worships, loves, and serves together. Here at Northaven, we have known for several decades that God calls us to love and accept all of God’s children, and that sexual orientation is not a barrier to our relationship with God, or to God’s love for us. We know that Jesus never says one word that would justify the “bullying” OR rejection of LGBT people in any way. We know that Paul’s words in the New Testament do not say one word about loving, committed long-term relationships that we see between gay couples and lesbian couples in our congregation and in society today. We know that if you turn to the teachings of Jesus, what he did teach is that we should love God, our neighbor and ourselves. We should treat our neighbors and others the way we wish to be treated. 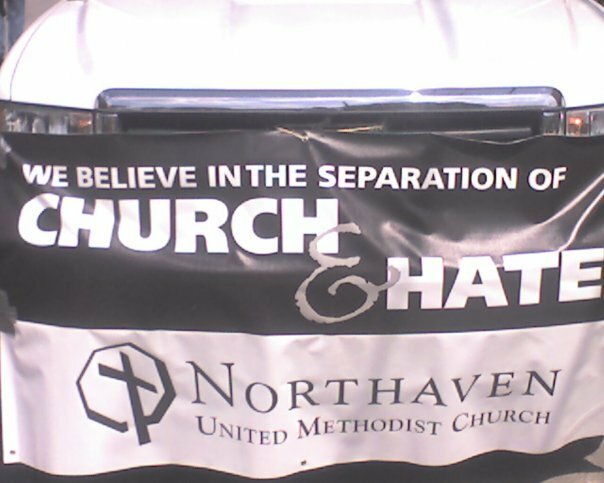 We at Northaven know that in many denominations, it is not the words or teachings of Jesus that allegedly justify the rejection of LGBT people. The only thing that justifies it is the received “teaching” of human beings in another historical time and culture. Despite these things we know, it is clear that many people within the Church of Jesus Christ (Church with a capital C) continue to reject and condemn LGBT people, and are often blatantly homophobic in their practice. Before I turn to that, let me talk a bit about the bullying that’s going on in society right now, and just why it seems to me it has become so lethal and dangerous. I actually believe there are some specific reasons as to WHY it is a lethal kind of bullying. Among our staff here at church, we like to tease each other and joke around in staff meetings. There is something quite healthy at being able to laugh at yourself and laugh with others. I’ve said before, I think it’s actually something of a sign of spiritual good health. When it’s done in genuinely good humor, it can be a very healthy thing. We do this in committee meetings sometimes too. We can gently tease each other and laugh with each other. But that’s not what’s happening in these instances of bullying. There’s also the sense that groups sometimes push weaker members to as to make them stronger. You see this in a litter of new born puppies, and that extra pushing that is done to the weakest and the smallest can help them grow stronger. But that’s not what’s happening in these instances of bullying either. Finally, teasing takes place among kids. When I was in the 7th grade at Westwood Junior High, I had a nickname. It’s a nickname I will not share with you, but it was a pretty humiliating nickname for a 7th grade boy. I remember being teased in gym class. I remember the pain of that. But teasing happens. You see, friends, when I was teased in 7th grade, never once did I believe or understand that this teasing was about my personhood. Never once did I connect this teasing with something inherent *about* me, who I am as a person. But this IS what happens with LGBT persons. Because of the negative stereotypes of LGBT persons in parts of our culture, because of the negative theological and spiritual messages about LGBT persons in parts of God’s Church, what in other places might just be “ordinary teasing” takes on an added, dangerous, and clearly sometimes lethal layer. And this is what raises this bullying far beyond and past more normal “teasing.” It reveals the horrifying truth we must confront in the Church of Jesus Christ: that the negative messages about gay and lesbian persons, the homophobic theology of churches, and even the silence of churches, allow bullies and bullied alike to believe God approves of it. So, having talked about this horrifying theological/spiritual layer to this bullying, I would like now to address some more folks who are probably not here today in the room. I would like to speak these next thoughts directly to the Church of Jesus Christ (with a capital C). Those who might be reading or hearing this out in the greater world. I want to speak now directly to clergy colleagues. I want to speak to lay people in other churches. Dear friends in Christ, it is time to end the harmful and negative messages in much of today’s Christian theology. I call upon all who consider themselves Christian to search their hearts, and search their faith, and to move toward the unconditional acceptance of LGBT persons. And in terms of effect on the culture, in terms of what people hear in an anti-gay Christian message, I want to say it all becomes one message to the ears of the hearers, in the ears of the culture. Let me illustrate. I’m sure you have all heard of the small Baptist “sect” from central Kansas. I will not dignify them by mentioning their name. But they are useful as an example today. They picket at the funerals of LGBT persons who have died. They picket at the funerals of members of our military. The hold up signs that say “God Hates…” (and I will not say the rest … You know what it is…) Everybody I know condemns them. Even other churches who reject LBGT persons reject their tactics. They are a marginal group, offensive on the scale of the KKK in a previous generation. And I am here to say this about the juxtaposition of the Baptist sect in Kansas and the Baptist preacher downtown: In terms of effect, effect on the culture, effect on the church, the message that is “heard out there,” there is NO daylight between them. One wears a slightly nicer suit and smiles at the camera while they say it. But in terms of effect, the words of “God Hates ____” and “Gay Is Not OK” are exactly the same! That is why we must call on all Christian Churches to reject such things. Because, dear church, this theology is potentially lethal, providing a theological framework for a bullying where words can turn to literal violence. Along these lines, maybe you heard this week that one of the large anti-gay Christian groups, Exodus International, has announced they will cancel their surreally-named “Day of Truth.” This was a day on which this anti-gay group encouraged Christian high school kids to confront their fellow LGBT teens with clear anti-gay messages in school. As I said, the leader of this group has apparently told CNN they will cancel this year’s event. While I cannot applaud the still dangerous goals of this group, I sincerely applaud them for backing off this dangerous program. And I suggest that the mere fact that they did cancel this event, in the current cultural milieu of these suicides, suggests a tacit admission on their part that they intuitively know this program was harmful to kids. So, the clear call is to repentance — to renounce and reject theology, spirituality, and practice that excludes, marginalizes and otherwise harms LGBT persons from understanding or hearing God’s full and unconditional love for them. But beyond this call for repentance to the Church of Jesus Christ, I want to address a final word to clergy and lay folk who may be in churches in the so-called “big fat middle.” (I call many of these churches “don’t ask, don’t tell” churches…) They are churches who never say anything, positive or negative, about gay or lesbian people, in part because they live in constant fear of controversy. They are nice people. They are good people. But I am here to say that this silence has become culpability. This silence, is now, itself, sin. Because of the existence of great swaths of anti-gay theology in “Christian” churches, it becomes even more imperative for those in the middle to speak out. So, if you are a clergy who has always been silently supportive, now is the time to publicly say something. If you are a congregation that is mostly “don’t ask, don’t tell,” now is the time to say something. That should tell us something. The reason to speak now is because if you do not, many will assume that you agree with an anti-gay theology. Future bullies will hear and believe that. Future LGBT teens will hear and believe that. Your silence could, quite literally, help kill people. I know that sounds dramatic. But that is precisely the point. With scores of LGBT teens attempting suicide, with six that have recently happened it is far, far FAR past time for us to speak boldly and prophetically on this issue. If you are a church in the “big middle” who is caught up in fear, and wanting to have a conversation on these issues, I can certainly encourage you to prayerfully consider our new “This I Know” study, a companion guide to the film “For the Bible Tells Me So.” We have produced this study with prominent nationally known theologians, and it would make a great way for your church to start talking about these issues. You can learn more about it at www.thisiknowstudy.org. I always used to say, “Because it’s important to send a message to ourselves and to the world that there is a difference between your church and the churches who are preaching messages of exclusion. But given the suicides of recent weeks let me say this more boldly, it’s important to put SEPARATION between your Christianity and the Christianity of the Kansas sect, and the Baptist preacher downtown. Speak out! Ironically, tomorrow is national “Coming Out Day” and many LGBT persons may be coming out of the closet for the first time. Churches and ministers who are silently supportive must also “come out.” It makes a difference. Maybe your church isn’t ready to be fully Reconciling. At least commit to a small group of the “This I Know Study.” Pastors, address the bullying and your own acceptance of LGBT persons in a pastor’s column. Do SOMETHING. Take action to show God’s love for LGBT persons. NOW is the time. A lot of people hate when anything about the Nazis gets mentioned. I get that. People in our culture are forever calling other people Nazis. But this quote isn’t really about Nazis. It’s about somebody inside the church, in the “silent majority” of churches, deciding they can no longer be silent, and realizing that their silence is aiding not the work of God, but the work of those who would spread hate. Earlier, I mentioned the small Baptist sect from Kansas (notice, I won’t even call them a church) and how they are somewhat like the KKK. But there is one crucial difference. Groups like the KKK eventually were marginalized when the church of Jesus Christ finally said “ENOUGH!” and pushed back against them. Average ordinary churches made being in the Klan a social anathema. People would no longer would tolerate that kind of racism, a racism that, like the current situation, too often seemed to be sponsored by, or silently approved by, the Church. One day, the forces of hate against LGBT may also be marginalized. But it will only happen when those in the middle of the road finally speak up and finally stand up. The Gospel lesson is instructive. Ten lepers are healed. Only one comes back to offer thanks and praise to Jesus. Only one stands up. The other nine do not. Dear Church of Jesus Christ: It can seem like a lonely and risky business to make a tough social stand on an issue like this. But more than your fear is at stake. Quite literally, as we have learned these last few weeks, lives are at stake. Church of Jesus Christ: be bold and prophetic in support of gay and lesbian people. Now is the time.